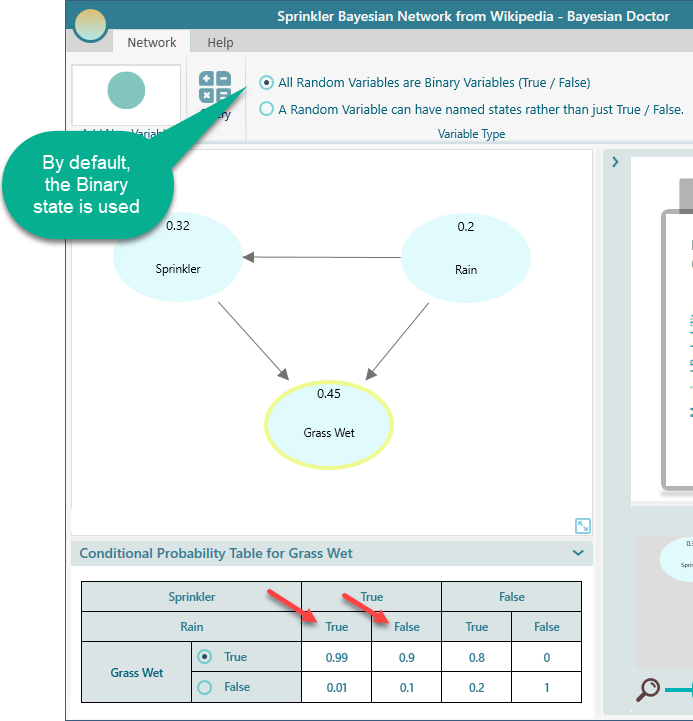 Usually, for the sake of simplicity and easy modeling, we stick to 2 state variables in a Bayesian Network. That's how the default mode is used in Bayesian Doctor. 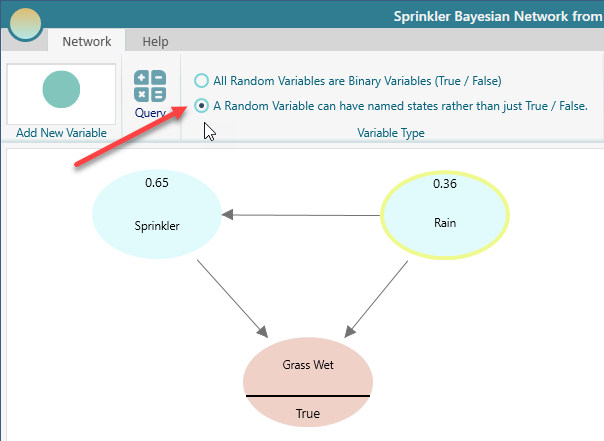 For example, notice the following Sprinkler example, we have 3 random variables and all of them have binary states "True" or "False"
There are many benefits to sticking to 2 state variables. 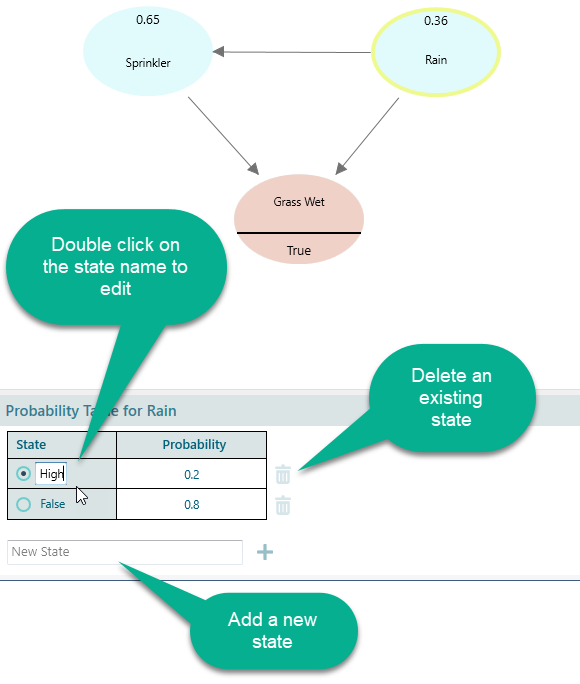 Conditional Probability Table becomes easy to maintain and simple. 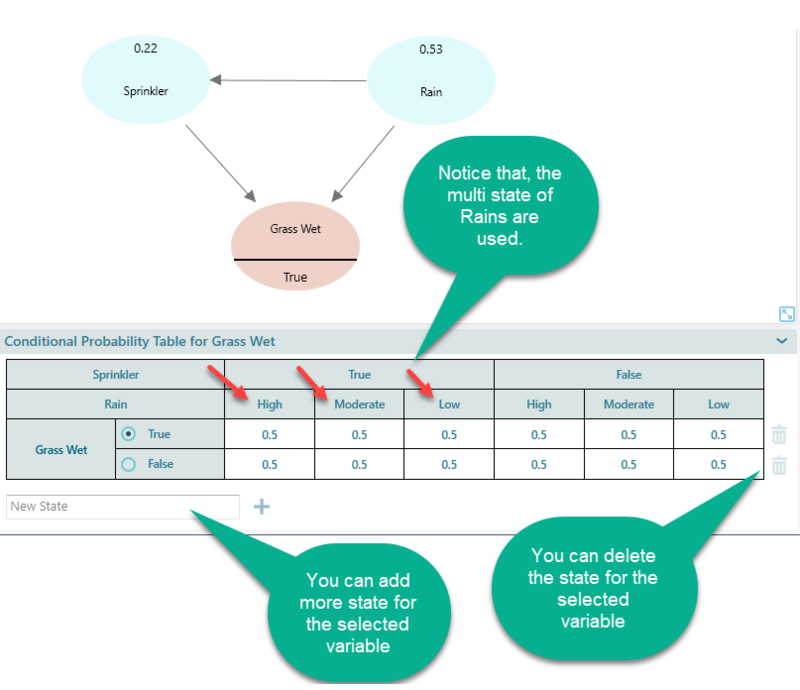 If the number of variables is high and if the variable's multiple states are tracked, it can be very difficult to work with that Bayesian network model. In Bayesian Doctor, when you have binary state variable, and when you edit one state probability, the other state's probability is automatically calculated. But you may be interested to model a variable with more than 2 states. For example, say, you want to define 3 states for Rain. "High", "Low", "Moderate". It is possible to use more than 2 states using Bayesian Doctor. Just check the following radio button. Once you do that, you can edit the state name of the variable by double-clicking the text. Once you add more than 2 states, you know that the sum of all probabilities for a given condition must be 1. When you had 2 states, Bayesian Doctor auto calculated the opposite state's probability. But when you have more than 2, you need to enter the valid probabilities so that the sum of all state probabilities for a given condition becomes 1. Bayesian Doctor offers a 'fix' button which can scale the probabilities so that the sum of all state probabilities for a given condition will become 1. Notice the hammer button? Click that one and your probabilities will be scaled.